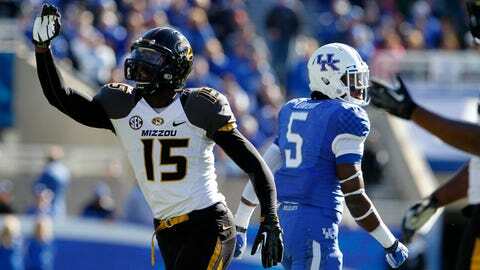 Dorial Green-Beckham was riding high when he scored four touchdowns against Kentucky. Now he awaits the possibility of facing felony drug charges. ST. LOUIS — Dorial Green-Beckham has a winning lottery ticket in his back pocket, but he hasn’t learned. Missouri’s standout wide receiver had a breakout sophomore season for the SEC East champion Tigers, who finished 12-2 and ranked fifth in the AP Top 25 and USA Today Coaches Poll. The 6-foot-6, 225-pound specimen, who was the No. 1 prospect coming out of high school, is already projected as a first-round pick in the 2015 NFL Draft. The news began to trickle out in the early hours of Saturday morning that Green-Beckham, 20, was arrested with two other men following a traffic stop in his hometown of Springfield, Mo., late Friday night. He allegedly had been riding in a vehicle with a pound of marijuana. Police stopped the vehicle, a 1999 Jeep Cherokee driven by John McDaniel, because of an expired license plate. But according to reports, the officer could smell an odor of marijuana. Green-Beckham, McDaniel and another man, Patrick Prouty, were arrested. The Springfield News-Leader reported Saturday evening that one pound of marijuana and assorted drug paraphernalia were found and police could pursue a charge of possession with intent to distribute a controlled substance. Now, it’s important to note that no formal charges — as of this writing — have been filed against Green-Beckham. His adoptive father, John Beckham, told the News-Leader that he doesn’t expect Dorial to be charged after the police conduct an investigation. "After being interviewed he was released," he said in a text message to the News-Leader. "We feel very confident that the investigation will result in no charges against Dorial. Dorial very much regrets being in this situation and our family looks forward to this being resolved." So it’s very important to note, again, that Green-Beckham has not been charged with anything yet, much less found guilty. But he’s certainly guilty of poor judgment. And it’s not the first time, either. This is his second marijuana-related arrest in just 15 months. Green-Beckham and two Mizzou teammates, wide receiver Levi Copelin and linebacker Torey Boozer, were arrested in October 2012 after they were reportedly smoking marijuana in a parking lot near Memorial Stadium. All three later pleaded guilty to second-degree trespassing. Green-Beckham reportedly paid a $200 fine and court costs. This one will cost more. This is a second strike against his character. If Green-Beckham isn’t the face of the Missouri football program — that honor likely belongs to Gary Pinkel — he’s close. His No. 15 Nike jersey, the one that parents buy their children, is sold throughout the Show-Me State. He’s the one with the "user-friendly, marketing-friendly, social-media-friendly acronym," as my colleague Sean Keeler wrote last month regarding Green-Beckham’s potential as a Heisman Trophy candidate in 2014. Green-Beckham obviously didn’t learn his lesson the first time, which makes this occurrence all the more troubling. He was suspended for a game. He paid his fine. He went back to being a college kid on scholarship to play football in the Southeastern Conference. He went out this season and helped Pinkel’s Tigers break through in their second year in the SEC. MIZ’s DGB was doing big things. He caught 59 passes for 883 yards and 12 touchdowns, including a school-record four against Kentucky. Then, one week after Mizzou’s Cotton Bowl win against Oklahoma State, Green-Beckham stepped into a Jeep with a pound of weed in the back and got arrested. That’s strike two for a player whom Oklahoma State coach Mike Gundy called, in the days leading up to the Cotton Bowl, a potential first-round draft pick. Green-Beckham is a guy always under the microscope, a former high school basketball and track and field state champion who set national records on the football field. Now Green-Beckham is risking taking that lottery ticket in his back pocket and ripping it to shreds. If a Mizzou athlete is charged with a felony, athletic department policy dictates that he/she is suspended from all team activities until the case is resolved. A felony conviction would result in automatic dismissal. Then again, this could come to nothing. That would be great news for a young man who still has very much growing up to do. By most accounts he is a nice kid. He has said all the right things during his interactions with the media. But he obviously didn’t learn his lesson from his first drug-related arrest. At the least he is guilty of making poor decisions. That won’t go unnoticed by NFL teams that, as of Friday afternoon, might have been willing to guarantee him millions of dollars following the 2015 NFL Draft. Now he looms as a character risk. And Green-Beckham has only himself to blame.